When researching the benefits of personal vaporizers aka e-cigs or more commonly known as electronic cigarettes, people become confused as e-liquid can contain nicotine, and a common misconception is nicotine can harm you; some will go as far as stating nicotine causes cancer and heart disease. But the facts prove it is other ingredients in tobacco smoke – not nicotine – that causes harm. Studies have shown that nicotine can be an effective treatment for many disease conditions and can prevent a number of other serious debilitating diseases (Nicotine Truth). As we have mentioned in previous blog posts, smokers continue the bad habit as they are addicted to nicotine, but die from the smoke generated by burning tobacco. So we decided to give you the 411 on nicotine, in hopes to eradicate this misconception once and for all! Firstly, what is NICOTINE? 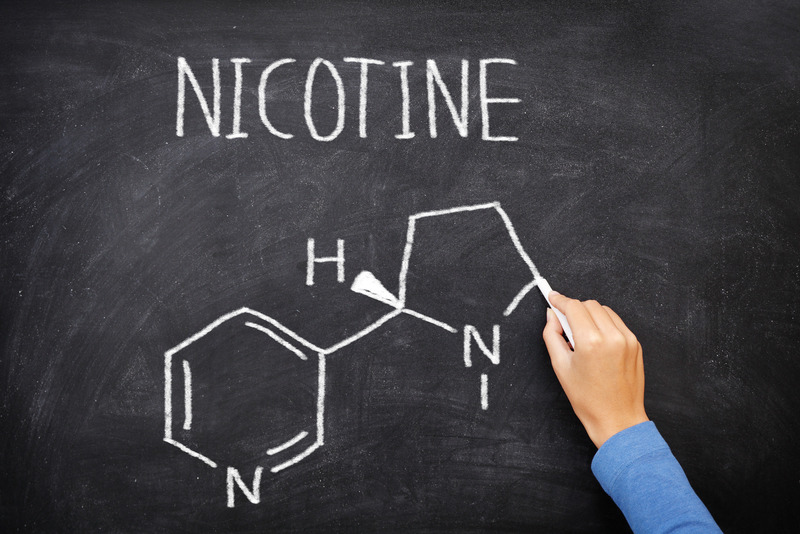 Medical News Today defines nicotine as “a nitrogen-containing chemical - an alkaloid, which is made by several types of plants, including the tobacco plant. Nicotine is also produced synthetically. Nicotiana tabacum, the type of nicotine found in tobacco plants, comes from the nightshade family. Red peppers, eggplant, tomatoes and potatoes are examples of the nightshade family.” We all know that nicotine is highly addictive and has been said to be harder to quit than heroin, but still remains one of the most popular drugs approved and easily available in the world. It is toxic to humans and animals and lethal at higher concentrations - which e juice never reaches – as it’s very difficult to reach such high concentration, especially since the resistance smoker developers over a period of time. As previously mentioned nicotine can be found in regularly consumed goods like potatoes, chili peppers, tea AND even found in the milk of lactating women! Now if nicotine is naturally found in breast milk, you need to realize it is not carcinogenic, but in high levels can be toxic, and the only substance in e juice and e cigs that can be proclaimed as harmful to vapers. Nicotine releases noradrenalin and adrenalin which increases smokers and vapers heart rate and can also raise user’s blood pressure. Even with such possible negative side effects, people who are addicted to nicotine find it’s useful to improve one’s productivity, fight anxiety and help with overall mental focus. It’s been prescribed to people who suffer from subclinical and clinical levels of depression, attention deficit disorders, schizophrenia, and other conditions find relief in smoking due to the nicotine delivery (Tobacco Harm Reduction 2010). A few of these benefits are comparable the effects of caffeine, though one-third of the population believe the benefits of nicotine to be particularly appealing. We hope this post cleared some of your questions surrounding nicotine, and as mentioned it is a highly addictive substance, that should not be consumed if you are not a current smoker, even with small quantities. We highly suggest vapers to aim to lower their nicotine over time with the end result being zero nicotine. Once you've reached 0 nicotine your nicotine craving will be gone and you can choose to stop vaping altogether. While nicotine is addictive most of the temptation with smoking is not just from the nicotine but the habit of smoking, the hand to mouth motion, the act of seeing vapor, social settings and any associations you had when you smoked. E-cigs are known to be 95% more effective than other alternatives available in the market, and should be consumed by current adult smokers looking for a cleaner alternative to traditional tobacco cigarettes. Happy vaping from all your friends at EsmokerCanada Inc.